Your life is meaningless. Get over it and be liberated. Every once in a while, I find myself reflecting on my place in the universe. 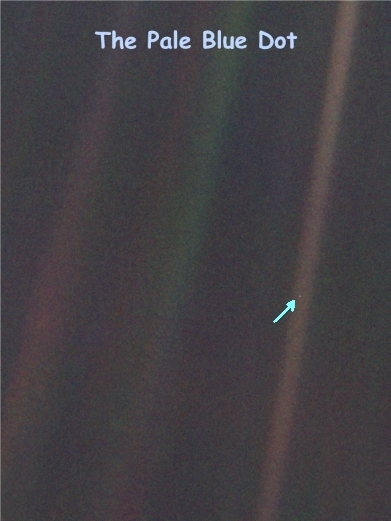 To refresh my sense of self, I like to watch Carl Sagan’s Pale Blue Dot. We talk about the view from 30,000 ft., but the view from 35 million miles is the one we should keep in mind. We are miniscule animals on a tiny planet circling a small star in a giant galaxy. There are at least 200 billion stars just like ours in our galaxy alone. And there are anywhere between 10 to 100 billion other galaxies. When you zoom out from a single person to the Earth to our sun to the 200 billion other stars in our galaxy and to the billions of other galaxies, you realize we are entirely irrelevant. The Universe is approximately 12 to 15 billion years old. The Earth is about 4.5 billion years old. Homo sapiens have been around for roughly 100,000 years. Earliest recorded history of humans dates back to at most 30,000 years ago (counting cave art here). 100,000 years among 15 billion years is a cosmic joke. It doesn’t even qualify as a hiccup in time. The average life expectancy for humans is under 80 years. The insignificance of that period time within 15 billion years cannot be overstated. Our lives go by quicker than a cosmic second. We are so small as to be nearly nonexistent. Yet we are led to believe that we are the center of the damn universe. Everything we do is so important. We lead these careful, guilt-ridden, cautious lives only to die abruptly and disappear into cosmic insignificance. I don’t know where it came from. I don’t know what it is or what it means. But we have this incredible gift of life for a very short period of time – and we spend it arguing and worrying and fighting and waiting. What are we waiting for? What – heaven? Hell? You have got to be kidding me. Please don’t tell me that you are wasting the one precious life you have waiting around for the fairytales of our ancestors. Our ancestors thought the stars were holes in the sky. They thought the Earth was flat, that the Sun revolved around us and that there is a man with a gray beard up in the sky. My guess is that if you brought back anyone who wrote our ancient religions, they would be amazed at what we have found out since the time they lived. But they would be even more amazed that people still believed what they had written in their utter ignorance. You are going to die one day and on your deathbed you are going to think, “What have I done with my life?” What will you answer? Have you lived enough? Have you truly tasted life? Will you be able to tell yourself that you gave life your best run? Look, I’m not telling you to quit your accounting job and run off into fields of flowers. Life might be a flash in the pan in cosmic time, but it lasts quite awhile from our perspective. You have to have balance. Enjoy the short term while planning for the long term. Enjoy yourself without infringing on others. Hedonism is not the answer. But a stodgy, unadventurous life isn’t either. There is something liberating about meaninglessness. We are cosmically insignificant, so who cares what we do? If you conquer the world and a comet runs into our planet three and half million years from now and wipes us out of history, your conquest will mean nothing. If you were a pauper who did nothing particularly grand with your life, history will not record that either. If you are gay or straight, an artist or a banker, a doctor or a patient, a cheater or a victim, a king or a peasant, history will not care. The steamroller of time and space will roll over your existence. No one is keeping a ledger. So, for the love of God, just please live the life you want to live, not the one you think you should live. There is no cosmic judge of your life. You will not be given extra credit at the end. You will only have what you have lived. Life is not a pop quiz. You will not graduate on to another life based on your score in this one. If you believe in God, it is an insult to Him to not cherish the life He has already given you. He has sent you a boat, a ship and a helicopter and you’re still wondering when salvation is going to come around. You have been given life so that you may live it. Our very insignificance is our salvation. If there is no meaning to life, there is also no pressure. Meaninglessness is liberating. The universe is indifferent to your tiny existence, so you might as well live it up. There will be no cosmic retribution or redemption. So, you are free to live as you choose. Enjoy. Misjudging our own importance is a form of exceptionalism. We think we are different from everyone or everything else, for example, we think: the sun revolves around the earth, we have Manifest Destiny to explain our genocide of the natives, we alone have a soul, or consciousness, we alone go to heaven. We believe in the sanctity of human life. We believe our rights come from God, as in “God-given rights”. We believe we are “endowed” with these rights, and nothing else is so endowed (although some have started to believe that all life may be endowed). If you are an atheist, the “rights come from God” argument won’t work, and getting endowed would be done by ….? I think our rights only come from our assertion that we have rights and only to the extent that we are willing to back up that assertion if these self-proclaimed rights are threatened. Some say that they will fight and die for these rights when others would attempt to take or reduce them. Who has the rights gets decided by who has the force. The law of the jungle prevails. This is the nature of the universe – the way it really is – naturally. "We'll let you cut the cake."